As the Super Bowl gets closer, authorities in New York and New Jersey are mounting a massive security operation to make sure game day is secure. NBC's national investigative correspondent Jeff Rossen reports. More than 80,000 football fans are expected to brave near-freezing temperatures to attend the New York region’s first Super Bowl on Sunday, and more than 3,000 security guards, 700 cops and hundreds of high-tech gadgets will be on hand to greet them. Similar armies of human and technological watchdogs will keep eyes and lenses trained on the tens of thousands of other people who will descend on the city to enjoy other festivities associated with America's top sports event – making it the biggest and most-expensive security net in the 48-year history of the game. The $1.6 billion Met Life Stadium in East Rutherford, N.J., where the game will be played, will be the most tightly guarded venue – with a 2.5 mile chain-link perimeter fence and cameras trained on every section and corridor inside. But multiple game-related events planned New York and New Jersey add several degrees of difficulty to the job of keeping fans and participants safe, security experts say. There is no intelligence indicating that terrorists have targeted the game or related events, but Hartnett says that doesn’t mean that threats don’t exist : “I would list them in priority order being a suicide bomber, a vehicle laden with explosives and a mass shooter or mass shooters similar to the Kenyan mall, or the Mumbai incidents,” he said. His concerns are echoed by law enforcement officials overseeing the game. Extensive mass transit, bridge and tunnel networks in the vicinity are a particular area of concern, according to a review of sensitive law enforcement documents detailing the Super Bowl security plan and intelligence by NBC News. The game is being billed as the “Mass Transit Super Bowl” by the New Jersey Transit system, and rail officials say the security experience for fans taking the train on game day will rival that of an airport, with bag-screening, K-9 teams and random searches for trains to and from the game. The documents also discuss an emerging threat: computer hacking. Could criminals use a cyber-attack to hit the infrastructure and control systems for the game? While not considered likely, officials recall what an accidental blackout did to last year’s game. Many of the key players in developing this year’s security plan attended the game in New Orleans and learned from the Superdome outage, which delayed the game for 34 minutes early in the third quarter. 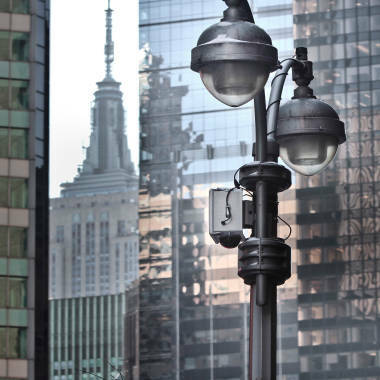 A temporary surveillance camera hangs on a Times Square light post on Thursday. Lt. Col. Edward Cetnar of the New Jersey State Police is the man in charge of security at the game itself. His task as incident commander is to make sure the matchup between the Seattle Seahawks and Denver Broncos goes off without a hitch. That requires planning for a triple threat: “Everything that we're doing has an air, land and sea concept,” he said. The need for aquatic security arises from the fact that the 750-acre stadium complex is almost entirely surrounded by waterways and thick marsh. “If you go through that marsh area, within feet, you're on Meadowlands stadium complex property,” Cetnar said. To prevent anyone from approaching the stadium that way, he said he’ll have helicopters scanning the area, troopers guarding the perimeter and boat patrols working the waterways. On Monday, officers with the federal Customs and Border Protection began checking all commercial vehicles arriving at MetLife Stadium for weapons, explosive devices and dirty bombs. “Today we’re supposed to see about 240 trucks – beer trucks, seat cushions, merchandise, food products – everything going into the stadium has to go through screening,” said Chief Kevin McCabe. Cetnar said he appointed 27 separate subcommittees to develop the security plan, with members drawn from all the law enforcement agencies involved, including the FBI, the Department of Homeland Security and the NYPD. In addition to sharing information and resources with those agencies, the State Police have attended the last three Super Bowls to ensure that nothing slips through the cracks. “We’ve stolen absolutely everything that has gone right,” said State Police Col. Rick Fuentes. The security force will be aided by an array of high-tech gadgets capable of spotting anything unusual. Thermal cameras on the helicopters, for example, would pick up even camouflaged individuals in the marsh. The marine patrols will be equipped with devices that “sniff” the air for radiation. Black shoebox-sized license plate scanners will check cars as they enter the parking lot. Similar devices will be deployed in New York City. Times Square, a crossroads for football fans and tourists, will be hosting a full-size toboggan run and football events leading up to game day. Police there will use security cameras there to keep watch on the crowds and an artificial intelligence system to help spot any unusual behavior. The latter system, which is controlled by the NYPD, can spot abandoned packages and bags and even circle the suspicious items in screen grabs from video so that police officers know exactly where to look. Security officials say most of the precautions they have taken will be invisible to the fans, and express confidence that the weather, with temperatures in the low 30s with the possibility of snow, will be the bigger distraction. And that’s as it should be, says Jeff Miller, the National Football League’s chief security officer. “This is the Super Bowl of football and not security,” he said.